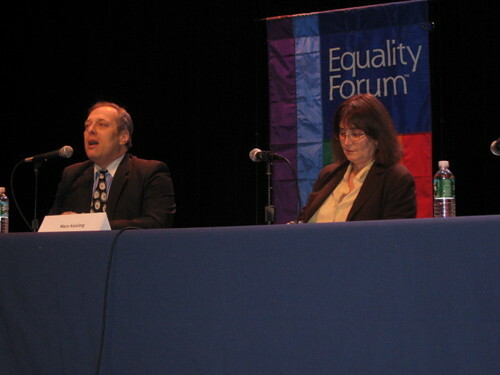 Mara Keisling and Stephen Glassman (facilitator) at Equality Forum (4/27/10). Courtesy of Cassandra King. For me, the most compelling part of Mara Keisling’s one-woman show last night at Equality Forum was her rare foray into the personal. Typically, she doesn’t share this story with media (am I media? discuss! ), because she’d rather leave that to other trans-people who otherwise don’t have a forum. This generosity and emotional maturity seemed to me a natural outgrowth of her personal journey. I was glad to have heard about that journey, because it placed into helpful context what she’d said earlier. When asked to assess the struggle for LGBT rights from an historical perspective, Keisling said that the movement had “started out much more privileged” than others — notably, we weren’t property and we could vote. From my perspective, the transgender community has been one of the most vilified, marginalized and just plain loathed groups in our history. Look no further than the long-standing reluctance by many in the mainstream gay rights movement to embrace our trans brothers and sisters for the underlining to this point. Why isn’t Keisling…angrier? It’s risky (and negative comment-inviting) to do too much psychoanalyzing based on the few snapshots of the transitioning process that she described, but it’s too much fun to resist trying. On the “what’s in a name?” front, Keisling said that she couldn’t settle on in her new life as a female. At one point, after she’d nervously consumed “76 rum and Cokes” — taking the Andrew Sisters’ invitation too far — she sat at a table filled with trans luminaries,1 and those present voted from a list of ten names she’d been considering. But her parents, in a moving show of support that many of us can only envy, got together with her and said that they wanted to name her. How could anyone not come out of such shows of support without charity of spirit? That, Keisling has in florid abundance. Perhaps because of that, she understands the frustration of those who want to scream and march in the street even though she’s not one of them. Sometimes, she allowed, that’s what you have to do.